According to The Pulse Of Radio, Jimmy Page credits the outtakes featured on LED ZEPPELIN's 1975 abum "Physical Graffiti" for helping define the band's beloved double album set, which just was reissued in expanded form this week. Just under half of the set was culled from the band's three previous albums — but none were discarded at the time due to their quality, but rather for not fitting the vibe of their parent album. Page told The Pulse Of Radio that with the extra room available on "Physical Graffiti", there finally was room for these orphan tracks to find a place. 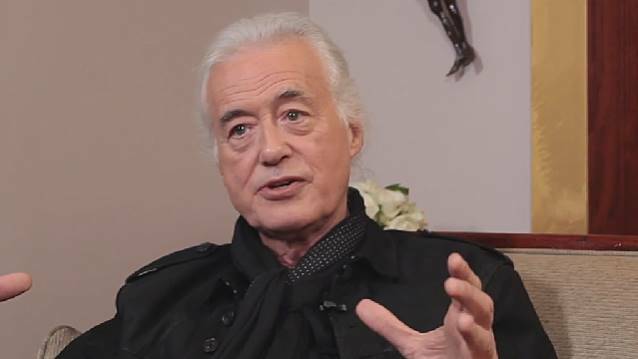 The Pulse Of Radio asked Jimmy Page if the inclusion of the outtakes from "Led Zeppelin III", "Led Zeppelin IV" and "Houses Of The Holy" were due to specific types of songs not being recorded during the "new" 1974 sessions for "Physical Graffiti". "Well, there's a number of contributing factors to it," he said. "The first thing is, that what comprises, like, the '74 recordings — 1974, I should say, [laughs] otherwise people might think there's 74 tracks and there's more to come! Um, but it was the second visit to Headley Grange. And on the first visit to Headley Grange, we'd come out with the material for the fourth album, for heaven sake. And there were three tracks left over; one of those was called 'Boogie With Stu', another one of those was 'Night Flight', and another was 'Down By The Seaside'. If you think about it, none of those tracks could've substituted anything that wagon the fourth album. That was really, really compact. It was perfect, y'know what I mean? The whole pacing of what was on it, and everything — but nevertheless — those three tracks were really cool; they all had strong character to them. And there was also 'Houses Of The Holy', [which] is an important one, because 'Houses Of The Holy' was kept back intentionally from the album 'House Of The Holy', to go on the next album — whatever album that may be. There was 'The Rover', there was the instrumental 'Bron-Yr-Aur' — there was this, that, and the other. They were all these things that were actually strong character pieces that could well go into a double album."